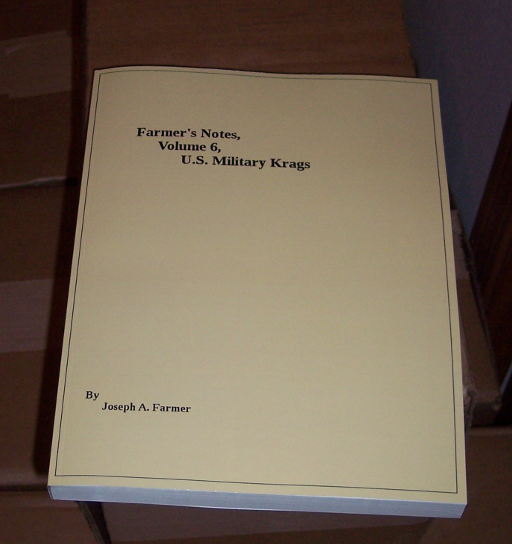 The Krag book. Farmer's "less than three weeks banging out that drivel" book. Only sold here. Unless other arrangements are made the only form of payment accepted is a money order. The books will be sent media mail. Be forewarned that I'm horrible at doing things regularly. Thus if you're the impatient type you should plan on going on a bender rather than waiting at the mailbox. I'll get them out - I'm just not going to get them out quickly. I know me. That's the way it'll be. "Change." Change is what you get back when you spend paper money. Include your email with your order. Price: $35 plus $5 S&H. $40 delivered in the U.S..
Buy three at the price of five and get one free. That's my sale price for people bad at math. People love getting a bargain. Satisfaction isn't guaranteed. In fact it's unlikely. All sales final. If you don't think you'll like it don't buy it. I wouldn't. 8.5"x11" Trade paperback. 300 pages. 750,096 characters of pure drivel along with bad photos to boot. You'll love it. You'll hate it. You'll feel like you were accosted by history. Your head will reel from the density. You won't be able to put it down until you've finished it. Then you'll say to yourself: "well, that wasn't really what I was expecting but it was worth the money. Every penny." Note: Clearer, better, copies of the images are online here but registration is required. The board does not permit self-registration so send me an email if you'd like to be registered.